Loads of flowers on a tiny plant! 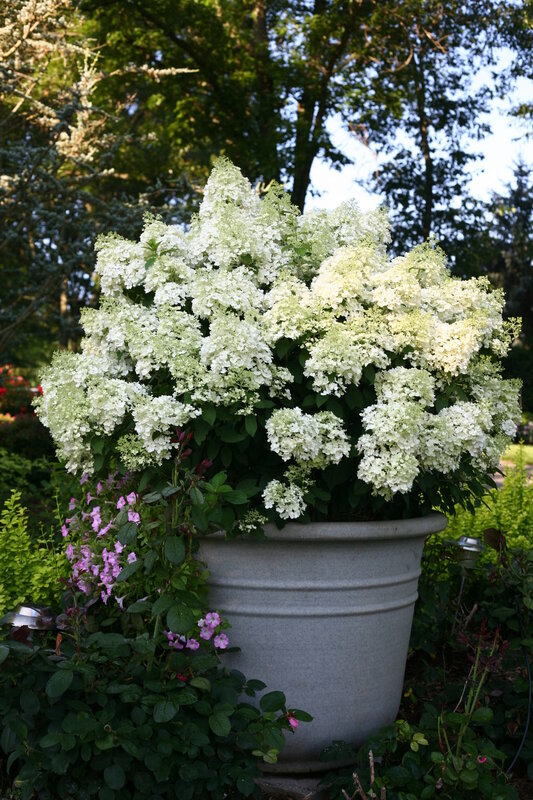 This dwarf panicle hydrangea will turn heads! 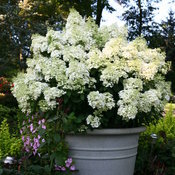 Bobo® hydrangea is engulfed by large white flowers in summer. 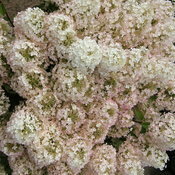 The flowers are held upright on strong stems, and continue to grow and lengthen as they bloom. 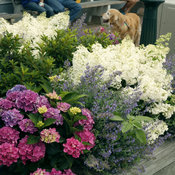 No flopping, unlike some panicle hydrangeas! As blooms age, they turn pink. It is compact and dwarf in habit, and the flowers cover every inch of the plant right down to the ground. 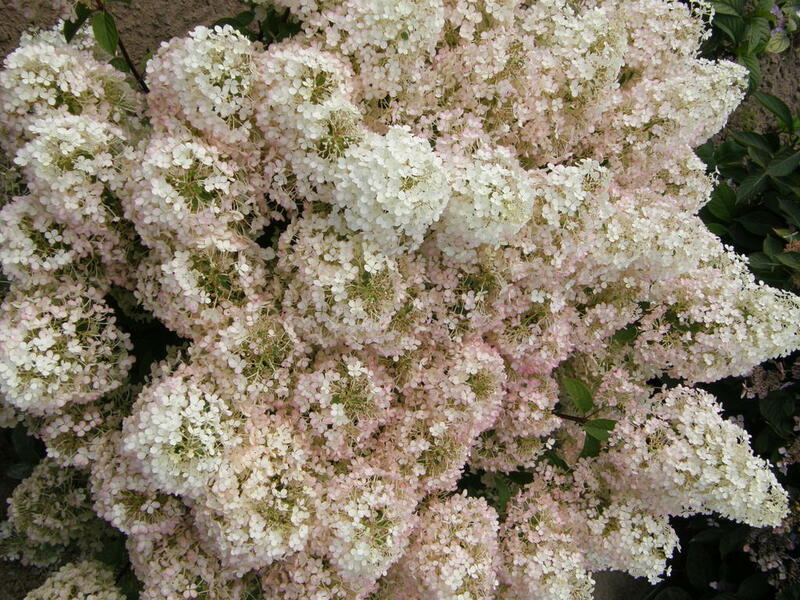 This plant was developed by Johan Van Huylenbroeck, the same breeder that developed Pinky Winky® hydrangea. Prefers good, loamy soil. Adaptable to many soils, moderate moisture required. 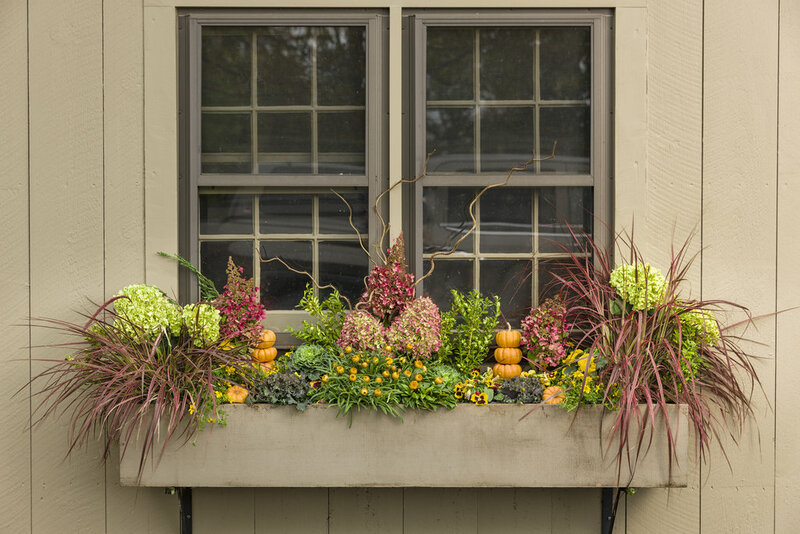 Blooms regardless of climate, soil, pH or pruning. Prune in late winter/early spring. Fertilize in early spring by applying a slow release fertilizer specialized for trees and shrubs. Follow the label recommendations for rates of application. I planted this for the first time this year - in Zone 5A. We have had a hot summer and so I have been watering this Bobo by sprinkler (I know, not ideal) overhead every day around 20 min. It receives morning shade and mostly afternoon sun. It is starting to show yellow leaves that keep falling, suggesting I am watering it too much. However, the flowers also show signs of sun-scorch (brown spots) so it has been very difficult to adjust watering time appropriately. I don't know if it is lacking iron, but I fertilized it early on when I had first planted it (May). Seems to be a fussy plant this year or maybe I am doing too many things wrong. I braided the three largest branches to make it like a tree. Three years old now and is a prolific bloomer with large full flowers. The chiffon are the best of the Rose of Sharon Hibiscus. I worked with a professional landscaper to design and install a complete landscape plan for our home in the mountains of North Georgia. 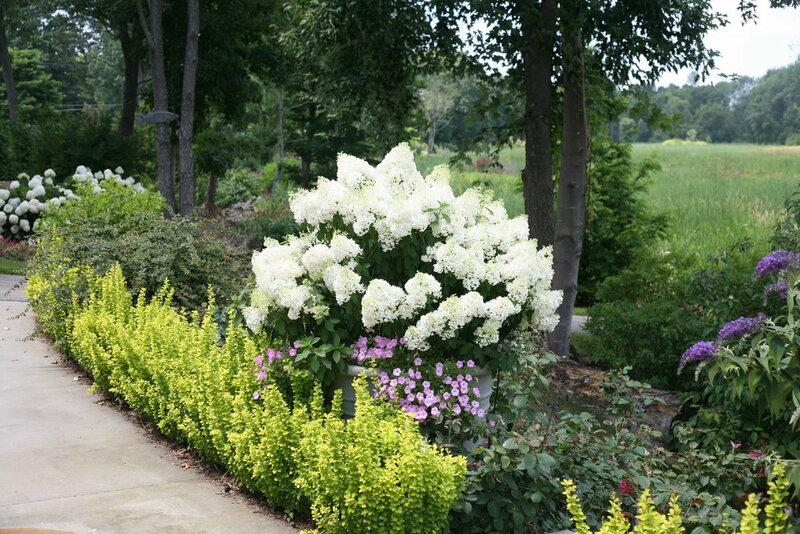 I selected BOBO Hydrangea to line the foundation of our home facing the roadway. I wanted a hydrangea that would remain upright and standout against our dark brown and stone mountain design home. Fifteen BOBOs grace the front of our home. 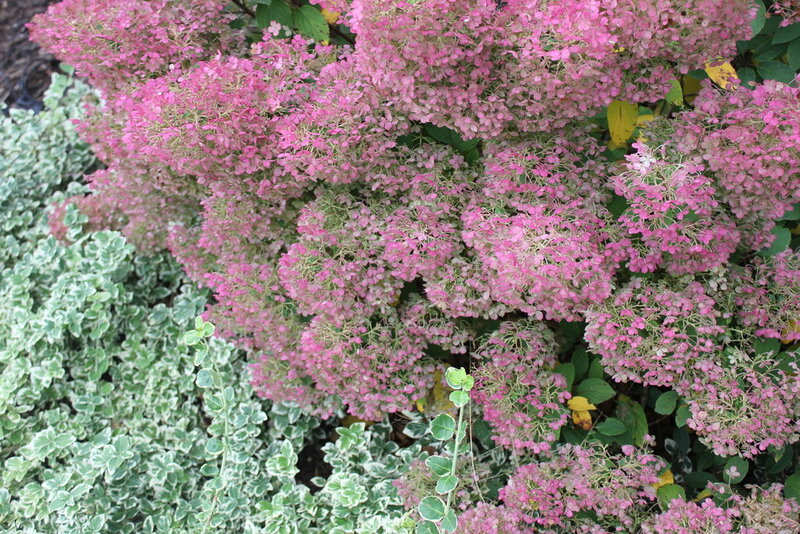 These stunning shrubs are loaded with magnificent white blooms and are more beautiful than we anticipated. 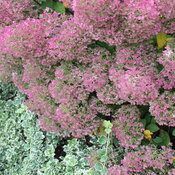 We view them from the roadside and from the decks above the bed in which they are planted. They are beautiful from every angle. We have neighbors and friends calling to ask us what they are and where we purchased them. We are very pleased with them. 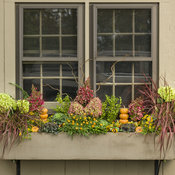 We are considering other areas in our landscape that would be enhanced by their gorgeous blooms. I saw this beauty on the Proven Winners website and found it at my local garden center at the beginning of May. I laughed and told my husband I had paid a lot of money for a stick. It was lonely looking but did have several little green buds on it so I thought I would give it a try. 8 weeks later the plant is just covered in blooms, about 30, and is looking lovely. I used the Proven Winners website suggestion to plant it with bubblegum supertunias and I couldn't be happier. Beautiful shrub I have it growing in my front flower bed where I needed a small hydrangea. It goes great with my cottage garden theme! Get it you will be satisfied! 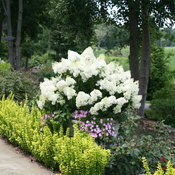 The Bobo Hydrangea was recommended last year after it's arrival. 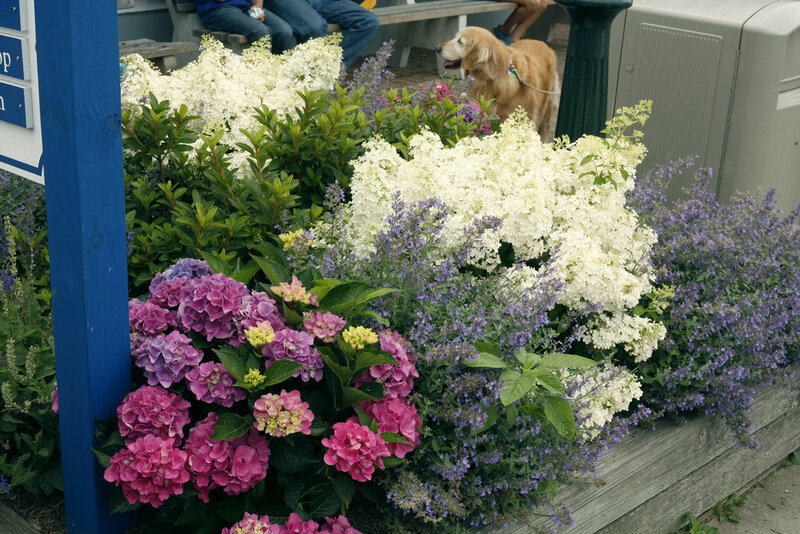 I have done the best with these types of hydrangeas since the mop heads do not perform in my yard well either. The first year I did not expect too much. We had a exceptionally hard winter this past year so when the snow finally melted, the bush wasn't looking it's best. I trimmed off the bad stuff and gave it a organic fertilizer. It was looking a little yellow. It has since greened up but in the middle of July I would of thought I would see some buds or something. Nothing yet. A little disappointed because the description says buds every year. Beautiful plant doing excellent in my full sun small garden! This plant arrived 8 weeks ago in perfect condition. I planted in on the SE corner of my house, and it is loaded with buds; it looks like a shrub that has been in place for years!